I've always been a fan of tasteful good girl art and artists like Petty and Varga, and growing up I was a fan of Hanna Barbera cartoons and the like. So, why not combine the two. Sure, I'lll never look back on childhood cartoons the same way again, but it's a fun premise, and a whole lot of fun to do. I saw all of these at PF, I think they're absolutely amazing. Whoa. Now I'LL probably never look at those cartoons the same way again either. Gorgeous artwork. Just don't do Bugs Bunny dressed in drag, okay? Some great drawings all over your blog! Nice work. I love these Chris! keep showing us girlies! COOOL illo!! Love the style! Thanks very much, everyone. I appreciate the feedback. 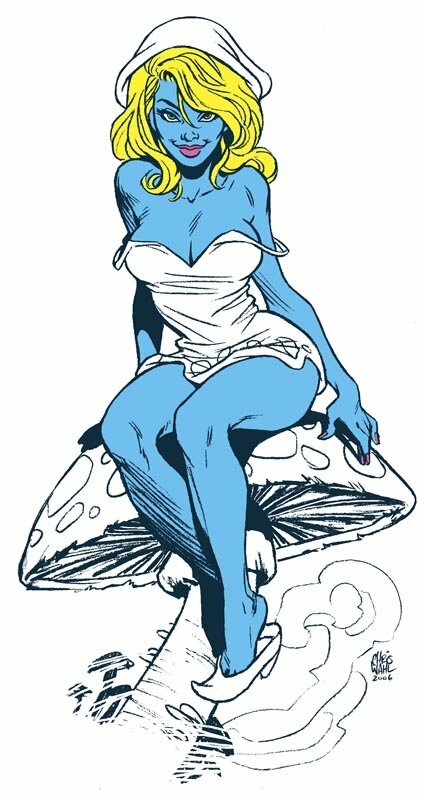 I've never liked Smurfs any bit. If it was like this, maybe I would have watched, as I've watched She-ha, instead of He-man.